Part of recovering from divorce involves adjusting to life without the other person in it. While it may feel good in a lot of aspects, you might find yourself at a loss on what to do with yourself and how to proceed. If you find yourself in this position, read on for some great tips on reclaiming your life. Most women talk about the "Hole" in their lives left from the other person's absence. When you divorce, you are without a partner, and no matter how you may feel about it, there are adjustments to be made. Dealing with this reality is part of the process of evolving into a single woman. Although you may not have a choice about the divorce, you do have choices about what comes next in your life. Let's look at the "hole" in a new way. Rather than concentrating on how empty it may feel, consider this- the "hole" offers opportunity for growth and change. Think about things you gave up during the marriage. It can be something as simple as watching a "girl movie" or as drastic as sky diving. The reality is that while marriage affords us lots of opportunity, it also involves compromise. When you are single, you do not have to compromise as much. You have many more options. Look at the hole as an opportunity for self-fulfillment. It can empower you in ways you may not have thought possible. 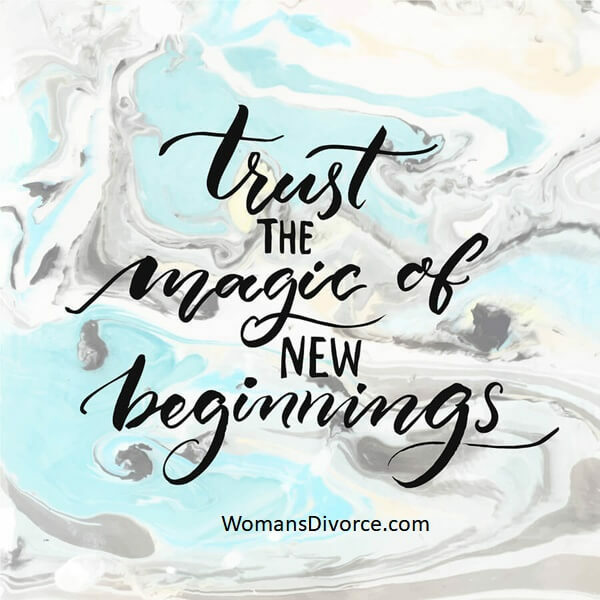 Here are some simple and fun suggestions from other divorcing women on filling the empty place in your life. Redo your bedroom the way you always wanted it to be. Sleep in the middle of your bed. Change your seating arrangement at meals or remove the extra chair. Make a list of things around the house that need to get done, that he would usually do. When you are feeling bored or lonely, tackle one of these projects. Home repairs and cooking are very similar. If you can follow directions, you can fix anything! Make long term plans - buy two tickets to a show you always wanted to see. Buy the tickets six months in advance. Don't worry who you will go with. You can always ask a friend or take your sister. It will give you something to look forward to. Plan a special event each weekend to do by yourself. It can be as simple as a bubble bath or something more elaborate. The point is to foster and encourage enthusiasm about time spent with yourself. Plan something social each weekend. This can be visiting a friend or family. It cuts down on the isolation and gives you something to look forward to. Plan a "chick flick weekend." This is when you just hunker down with all the girl movies he refused to see, and of course, a big bowl of popcorn. Put away all the mementos and things that remind you of him. "Feminize" your living space. Do something he never would have approved of - anything from eating Oreos in bed to dying your hair green! Today, look at the "hole" as an opportunity to bring new experiences into your life. Consider that you have infinite choices! While there may be losses in your life, today focus on the opportunities and options you have. Return to top of Recovering from Divorce.